I really like twitter, but I hate the way search throttles you. 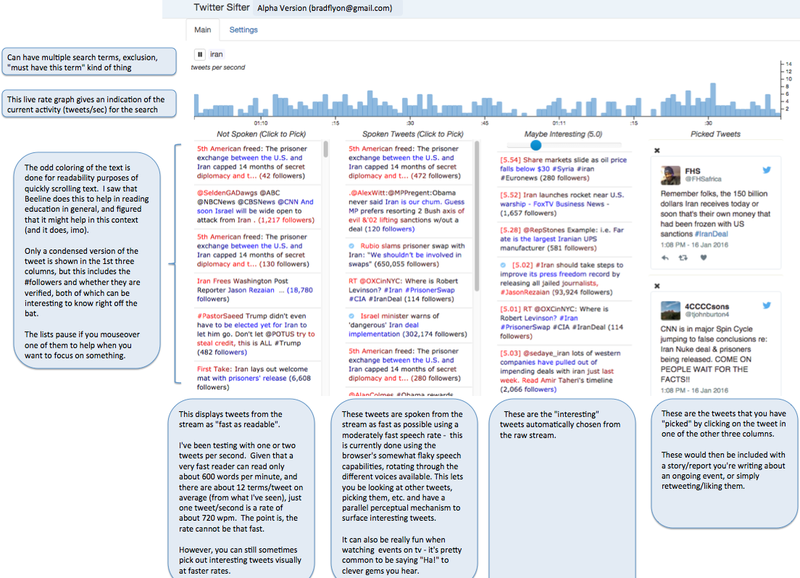 You have to keep pulling down, or click on the "40 new results" link to be spoonfed dribbles of tweets. 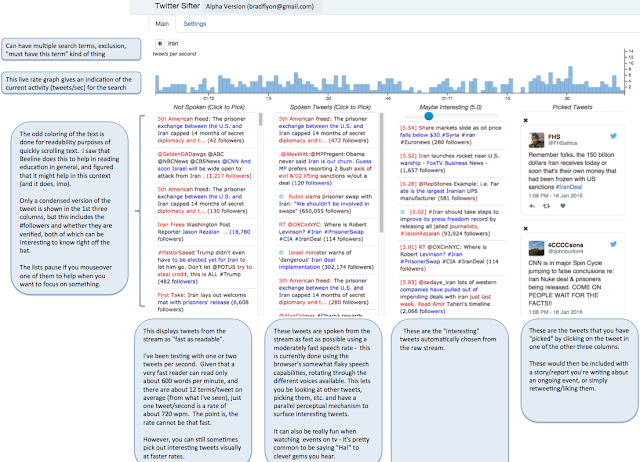 So, making use of the twitter streaming api, I have been playing with a personal tool to get around this, so that you can have a more uninterrupted view of the tweets that match your search terms. This little project is currently called "Twitter Sifter". It can be a lot of fun to use while watching sporting events, tv shows, or really any live event. For "breaking news", it can help you spot those first bursts of new information. All while avoiding continual clicking to get new information. There is also a graph of the current tweets per second, which is really fun during a football game right when something crazy happens. What's up with the funny text coloring? I have been looking around a lot to find out how to efficiently throw a lot of text at your eyes while still making it readable. I learned that most people can only read about 300-600 words per minute, which roughly equates to at most about one tweet per second. But another factor that can help is to color the text as shown in the screeenshot. This is something Beeline has been doing to enhance and improve reading. Basically, you just rotate the colors from red to black to blue to black to red again, over and over. It actually seems to work. The different colors help your eyes find the lines better. By having the tweets spoken as fast as possible, it provides a parallel sensory input mechanism that lets you simultaneously ingest more information while also being able to enjoy the witty gems that can come out of twitter (as can others in the room with you). Cycling through the different possible voices on your computer provides a nice touch of variety as well. So many times there are true gems from twitter users with tiny numbers of followers. I try to make sure and retweet and/or like these to show that there are those out there listening who are appreciating what they said. For a highly tweeted about search term/hashtag,there are too many tweets occurring to think you can read or hear all of the tweets that might be of interest. For this reason, there is also a component that analyzes each tweet for an (experimental) "interest" score relative to all of the tweets seen so far, and will display those whose score is above a controllable threshold. I have listened to a lot of different topics/events via Twitter Sifter. Sometimes, however, you just get tired of a lot of the same old chatter - there is a sizable fraction of the same stuff that is almost copy-pasted from any other football game, for example. It really makes you feel for what an omniscient being has to put up with.